Abstract: Alemtuzumab is an anti-CD52 monoclonal antibody, recently approved for the treatment of active, relapsing multiple sclerosis (MS). Administration of alemtuzumab causes a rapid and dramatic reduction in circulating lymphocytes, with a predictable subsequent pattern of immune reconstitution. Although the precise mode of action remains unclear, treatment results in a marked reduction in annualized relapse rates, slowing of disability progression compared with an active comparator, and may even cause disability reversal. Although conferring clear clinical benefits, alemtuzumab carries a significant long-term risk of autoimmune disease (AID), which has a particular predilection for the thyroid gland, although a wide range of other disorders have also been reported. However, risks of AID can usually be anticipated and treated successfully, provided rigorous monitoring and surveillance protocols are followed by clinicians and patients alike. Despite its immunosuppressive mechanism of action serious infections are rare and malignancies commonly associated with immunodeficiency have not been observed to date. Alemtuzumab’s unique mode of administration, as well as it’s durability of effect, provides an important addition to currently available therapeutic interventions for MS, and in particular is a valuable treatment option in recent onset and highly active relapsing disease. Multiple sclerosis (MS) is a common inflammatory, demyelinating disease of the central nervous system (CNS)1 with a worldwide prevalence of approximately 2.5 million2 and an estimated lifetime cost per individual of $2.2 million.3 Reported disease prevalence is gradually increasing4 and there is an urgent need for treatments which are both safe and efficacious. Genome wide association studies have implicated genes involved in T-lymphocyte function and cell-mediated immunity in disease pathogenesis.5,6 The mode of action of currently available drugs has generally been targeted at these aspects of the immune system by modulating lymphocyte function,7,8 affecting lymphocyte trafficking,9 or depleting lymphocyte numbers.10 The main impact of these drugs has been directed toward markers of inflammation during the earlier relapsing phase of disease by reducing frequency of clinical relapse as well as surrogate radiological markers of inflammation. However, the long-term aspiration is that this strategy will also eventually result in the prevention of long-term disability progression. There is a now a steady stream of new drugs being licensed and approved for use in MS, but despite their demonstrable efficacy in reducing relapse rates and radiological indicators of disease, their effect on disease progression and disability has been less striking. Alemtuzumab is an anti-CD52 humanized monoclonal antibody recently licensed for the treatment of active MS in the European Union,11 Canada,12 Australia,13 Brazil,14 Mexico,15 the UK,16 and was also approved for use in the US in November 2014 after a controversial initial rejection.17,18 Clinical trials have demonstrated superior efficacy against an active comparator (interferon beta-1a) and uniquely for drugs used in the treatment of MS, some data have shown a pattern of disability reversal.10,19,20 In this review, we aim to summarize the mechanism of action of alemtuzumab, its clinical efficacy and side effect profile and speculate on its role in the ever-expanding landscape of MS therapeutics. When used in the context of MS, alemtuzumab is administered intravenously at a dose of 12 mg/day (d) for 5 consecutive days, with a further 3-day course 12 months later. In order to negate the cytokine release effect of monoclonal antibody treatment, patients are preadministered with 1 g of intravenous methylprednisolone for the first 3 days of each treatment course. Within clinical trials, patients were retreated with a subsequent 3-day course of alemtuzumab if they experienced ≥1 protocol-defined relapse or ≥2 new or enlarging brain or spinal cord lesions.40 In clinical practice, retreatment with a further 3-day course is often applied if a clinical relapse or new radiological disease activity is observed, although the precise boundaries of relapse characteristics or other markers of disease activity which may prompt retreatment have yet to be defined. Following the encouraging results of the early experience with alemtuzumab, one Phase II trial (CAMMS223)10 and two Phase III trials (CARE-MSI and CARE-MSII) were undertaken.19,20 CAMMS223 compared low- and high-dose alemtuzumab against an active comparator (high dose interferon beta-1a) in patients with early, active, relapsing-remitting MS (RRMS)10 – the first time in MS drug trials that an active comparator had been employed. The subsequent Phase III trials investigated the use of alemtuzumab with relapsing MS in treatment naïve patients (CARE-MSI)20 and in those patients who had previously been treated with alternative disease modifying therapies (DMTs) (CARE-MSII).19 The main clinical outcomes and adverse events from these trials are summarized in Table 1. Abbreviations: SAD, sustained accumulation of disability; RTA, road traffic accident; EDSS, expanded disability status score; ITP, idiopathic thrombocytopenia purpura. Abbreviations: SAD, sustained accumulation of disability; EDSS, expanded disability status score; ITP, idiopathic thrombocytopenia purpura. The principal longer term adverse event related to alemtuzumab use in MS patients has been that of novel autoimmune disease (AID). The thyroid gland appears to be the most common target but other conditions such as idiopathic thrombocytopenic purpura (ITP), autoimmune hemolytic anemia, autoimmune neutropenia, and Goodpasture’s syndrome have also been recognized, although at much lower frequencies.10,19,20 It is not entirely understood why AID occurs following alemtuzumab therapy, although it has been suggested that it may be related to homeostatic T-cell proliferation after lymphocyte depletion.56 However, it does appear to be a largely disease-specific phenomenon since an increased frequency of autoimmune thyroid disease is not observed in patients with B-cell chronic lymphocytic leukemia. This would seem to suggest that there are specific factors associated with MS disease pathogenesis that play a role in AID expression in this context,57 and therefore may offer a unique insight into human autoimmunity. In data available from clinical trials, most infections were mild to moderate and responded to conventional therapies but were observed in 67%–77% patients in the Phase III trials receiving alemtuzumab at the 12 mg dose.19,20 The most common infections included nasopharyngitis, upper respiratory tract infections, urinary tract infections, herpes viral infections, sinusitis, and influenza.19,20 Spirochetal gingivitis, pyogenic granuloma, and listeria meningitis were the only infections observed in the open-label studies that may have been attributable to immunosuppression. All patients are now given dietary advice regarding listeria as the case of listeria meningitis occurred following ingestion of unpasteurized cheese.29 Herpes virus infections were the most commonly observed infections in the Cambridge open-label long-term follow-up cohort with 13% of patients experiencing reactivation of varicella zoster virus.54 However, this infection is now largely avoided by the administration of prophylactic oral aciclovir following infusion and pretreatment vaccination programs. Once again, despite profound T-lymphocyte depletion, which might have been considered to increase risk of malignancy in patients treated with alemtuzumab, this has so far not been observed. Although some cases of malignancy did occur in alemtuzumab treated patients within the clinical trials, these studies were not powered in such a way as to detect small changes. Overall, in the Phase II trial malignancy was observed in 2.8% of patients taking the 24 mg dose and 0.9% of patients taking interferon beta-1a.10 In CARE-MSI and CARE-MSII (12 mg), malignancy rates for alemtuzumab vs interferon beta-1a treated patients were 0.5% vs 0% and 0.6% vs 1.5% respectively.19,20 Outside of clinical trials, one case of malignant melanoma and one case of Castleman’s disease (a prelymphomatous condition) have been observed.29,65 No further malignancies were observed in the Cambridge long-term open-label follow-up.54 However, because of the theoretical risk of cervical malignancy with T-lymphocyte depletion, it is the practice in our institution to ensure that female patients have had a recent cervical smear examination prior to treatment and to encourage continued engagement in locally available cervical screening programs in the longer term. As a result of the high incidence of adverse autoimmune events following infusion, the parent company also recommends rigorous monitoring of patients receiving alemtuzumab (Table 3). In particular, laboratory tests should be conducted at periodic intervals for 48 months following last treatment course. This includes complete blood count with differential (prior to treatment initiation and at monthly intervals thereafter), serum creatinine levels (prior to treatment initiation and at monthly intervals thereafter), urinalysis with microscopy (prior to treatment initiation and at monthly intervals thereafter), and thyroid function tests (prior to treatment initiation and every 3 months thereafter).60 The FDA also recommends skin examination at the start of treatment and yearly thereafter to monitor for melanoma.68 Physician and patient education regarding the identification of clinical features of adverse AID is also crucial in identifying adverse events early. 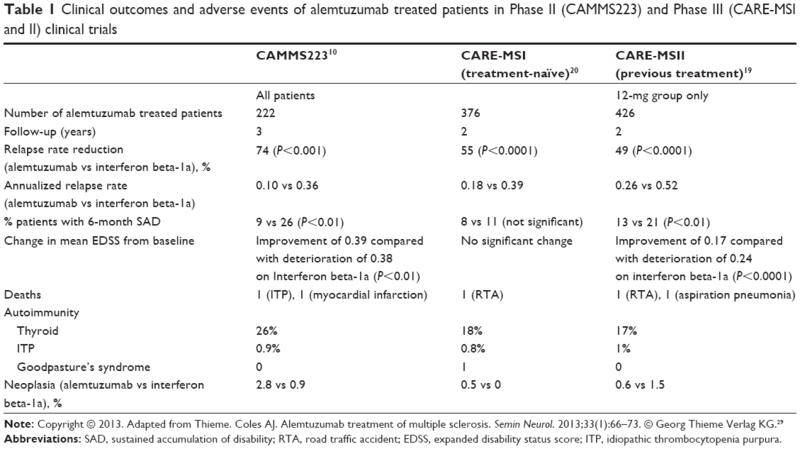 Alemtuzumab has been shown to be effective in reducing relapse rates and to have an effect on disability progression, but its role in a number of therapeutic strategies now available to clinicians is still to be fully established and is reflected in the variance in licensed indications internationally (Table 4). For example, in Europe and Australia, alemtuzumab is available for use in patients with “active disease defined by clinical or imaging features”.11,13 This is in contrast to the recent decision from the FDA who have now approved its use after initial rejection cautioning that it should be “reserved for patients who have had an inadequate response to two or more drugs indicated for the treatment of MS”.17 Although award of a license in the US is encouraging, the trial data suggest that treatment is most efficacious when given early in the disease course. By adopting a strategy which dictates that patients should fail two drugs before commencing alemtuzumab, the “window of therapeutic opportunity”43 for effective control of disease over the longer term as well as future avoidance of fixed disability may be missed. Abbreviations: MS, multiple sclerosis; DMTs, disease modifying therapies. Despite its impressive efficacy, there is still uncertainty concerning retreatment after the initial standard treatment cycle (two treatment courses over 12 months). Should treatment continue indefinitely if the patient continues to relapse or has active radiological disease or should a new agent be introduced, and if so which one? From the Cambridge long-term follow-up study, alemtuzumab appears to have a remarkably durable treatment effect with the majority (52%) only requiring the standard treatment cycle after a median 7-year follow-up, only 36% of patients receiving three, 8% four and 1 patient five cycles.54 It is unknown what effect further immunosuppression with agents such as natalizumab or the newer oral agents may have on efficacy or future adverse events and this will need to be further explored in future studies. With oral disease modifying agents now becoming widely available, patient choice may move away from standard injectable treatments. However, it is likely that alemtuzumab will be a popular choice for selected patients, especially those with aggressive relapsing disease and poor prognostic indicators. In contrast to standard DMTs, and indeed other monoclonal antibody therapies such as natalizumab, the standard two-treatment courses for alemtuzumab is convenient for patients who only need attend hospital for 8 days of treatment in a 12-month period. It may also have a particular role for those patients who are planning to become pregnant since patients are advised to use effective contraception for only 4 months after infusion. Alemtuzumab is an efficacious treatment for active relapsing MS having been shown in robust clinical trials and against an active comparator to significantly reduce relapse rates, MRI outcomes and, at the very least, achieve some stabilization of disability progression in both treatment-naïve and treatment-experienced patients. Although autoimmune adverse events are common, our experience is that they are largely predictable and can be recognized and treated early with a robust surveillance and monitoring program, which may make practical use of this therapy more suited to the larger specialist MS clinical services. Both authors made substantial contributions to conception and design, acquisition of data, or analysis and interpretation of data; took part in either drafting the article or revising it critically for important intellectual content; gave final approval of the version to be published; and agree to be accountable for all aspects of the work in ensuring that questions related to the accuracy or integrity of any part of the work are appropriately investigated and resolved. Neil P Robertson and his institution (University Hospital of Wales) have received funding from a neuroimmunology fellow program supported by Genzyme. The authors report no other conflicts of interest. Multiple Sclerosis Trust. Prevalence and incidence of multiple sclerosis. Available from: http://www.mstrust.org.uk/atoz/prevalence_incidence.jsp. Accessed Januray 16, 2015. Whetten-Goldstein K, Sloan FA, Goldstein LB, Kulas ED. A comprehensive assessment of the cost of multiple sclerosis in the United States. Mult Scler. 1998;4(5):419–425. Hirst C, Ingram G, Pickersgill T, Swingler R, Compston DA, Robertson NP. Increasing prevalence and incidence of multiple sclerosis in South East Wales. J Neurol Neurosurg Psychiatry. 2009;80(4):386–391. Patsopoulos NA, Barcellos LF, Hintzen RQ, et al. Fine-mapping the genetic association of the major histocompatibility complex in multiple sclerosis: HLA and non-HLA effects. PLoS Genet. 2013;9(11):e1003926. Zafranskaya M, Oschmann P, Engel R, et al. Interferon-beta therapy reduces CD4+ and CD8+ T-cell reactivity in multiple sclerosis. Immunology. 2007;121(1):29–39. Neuhaus O, Farina C, Yassouridis A, et al. Multiple sclerosis: comparison of copolymer-1-reactive T cell lines from treated and untreated subjects reveals cytokine shift from T helper 1 to T helper 2 cells. Proc Natl Acad Sci U S A. 2000;97(13):7452–7457. Johnson TA, Lapierre Y, Bar-Or A, Antel JP. Distinct properties of circulating CD8+ T cells in FTY720-treated patients with multiple sclerosis. Arch Neurol. 2010;67(12):1449–1455. Coles AJ, Compston DA, Selmaj KW, et al. Alemtuzumab versus interferon beta-1a in early multiple sclerosis. N Engl J Med. 2008;359(17):1786–1801. Genzyme. European Commission approves Genzyme’s multiple sclerosis treatment Lemtrada™ (alemtuzumab) [press release]. Cambridge, MA: Genzyme; 2013 [September 17]. Available from: http://news.genzyme.com/press-release/european-commission-approves-genzymes-multiple-sclerosis-treatment-lemtrada-alemtuzuma. Accessed January 12, 2015. Genzyme. Genzyme’s Lemtrada™ approved in Canada for tratement of multiple sclerosis [press release]. Available from: http://news.genzyme.com/press-release/genzymes-lemtrada-approved-canada-treatment-multiple-sclerosis. Accessed January 16, 2015. Genzyme. Genzyme’s Lemtrada™ approved in Australia for treatment of multiple sclerosis [press release]. Available from: http://news.genzyme.com/press-release/genzymes-lemtrada-approved-australia-treatment-multiple-sclerosis. Accessed January 16, 2015. Genzyme. Genzyme’s Lemtrada™ approved in Brazil for treatment of multiple sclerosis [press release]. Available from: http://news.genzyme.com/press-release/genzymes-lemtrada-approved-brazil-treatment-multiple-sclerosis. Accessed January 16, 2015. Genzyme. Genzyme’s Lemtrada® approved in Mexico for treatment of multiple sclerosis [press release]. Available from: http://news.genzyme.com/press-release/genzymes-lemtrada-approved-mexico-treatment-multiple-sclerosis. Accessed January 16, 2015. National Institute for Health and Care Excellence. Alemtuzumab for Treating Relapsing-Remitting Multiple Sclerosis. London, UK: NICE; 2014. Available from: http://www.nice.org.uk/guidance/ta312/resources/guidance-alemtuzumab-for-treating-relapsingremitting-multiple-sclerosis-pdf. Accessed January 16, 2014. Genzyme. Genzyme’s Lemtrada approved by the FDA [press release]. Available from: http://news.genzyme.com/press-release/genzymes-lemtrada-approved-fda. Accessed January 16, 2015. Coles AJ, Compston A. 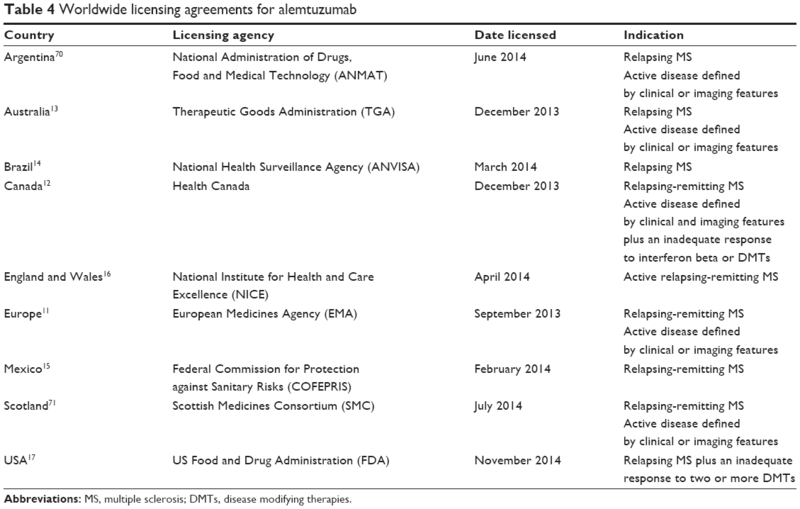 Product licences for alemtuzumab and multiple sclerosis. Lancet. 2014;383(9920):867–868. Hale G, Rye PD, Warford A, Lauder I, Brito-Babapulle A. The glycosylphosphatidylinositol-anchored lymphocyte antigen CDw52 is associated with the epididymal maturation of human spermatozoa. J Reprod Immunol. 1993;23(2):189–205. Hale G. The CD52 antigen and development of the CAMPATH antibodies. Cytotherapy. 2001;3(3):137–143. Rao SP, Sancho J, Campos-Rivera J, et al. Human peripheral blood mononuclear cells exhibit heterogeneous CD52 expression levels and show differential sensitivity to alemtuzumab mediated cytolysis. PLoS One. 2012;7(6):e39416. Rowan WC, Hale G, Tite JP, Brett SJ. Cross-linking of the CAMPATH-1 antigen (CD52) triggers activation of normal human T lymphocytes. Int Immunol. 1995;7(1):69–77. Watanabe T, Masuyama J, Sohma Y, et al. CD52 is a novel costimulatory molecule for induction of CD4+ regulatory T cells. Clin Immunol. 2006;120(3):247–259. Klotz L, Meuth SG, Wiendl H. Immune mechanisms of new therapeutic strategies in multiple sclerosis-A focus on alemtuzumab. Clin Immunol. 2012;142(1):25–30. Somerfield J, Hill-Cawthorne GA, Lin A, et al. A novel strategy to reduce the immunogenicity of biological therapies. J Immunol. 2010;185(1):763–768. Fox EJ. Alemtuzumab in the treatment of relapsing-remitting multiple sclerosis. Expert Rev Neurother. 2010;10(12):1789–1797. Hu Y, Turner MJ, Shields J, et al. Investigation of the mechanism of action of alemtuzumab in a human CD52 transgenic mouse model. Immunology. 2009;128(2):260–270. Kousin-Ezewu O, Azzopardi L, Parker RA, et al. Accelerated lymphocyte recovery after alemtuzumab does not predict multiple sclerosis activity. Neurology. 2014;82(24):2158–2164. Cossburn MD, Harding K, Ingram G, et al. Clinical relevance of differential lymphocyte recovery after alemtuzumab therapy for multiple sclerosis. Neurology. 2013;80(1):55–61. Robertson N, Scolding N. Immune reconstitution and treatment response in multiple sclerosis following alemtuzumab. Neurology. 2014:2150–2151. Thompson SA, Jones JL, Cox AL, Compston DA, Coles AJ. B-cell reconstitution and BAFF after alemtuzumab (Campath-1H) treatment of multiple sclerosis. J Clin Immunol. 2010;30(1):99–105. Hill-Cawthorne GA, Button T, Tuohy O, et al. Long term lymphocyte reconstitution after alemtuzumab treatment of multiple sclerosis. J Neurol Neurosurg Psychiatry. 2012;83(3):298–304. Cox AL, Thompson SA, Jones JL, et al. Lymphocyte homeostasis following therapeutic lymphocyte depletion in multiple sclerosis. Eur J Immunol. 2005;35(11):3332–3342. Zhang X, Tao Y, Chopra M, et al. Differential reconstitution of T cell subsets following immunodepleting treatment with Alemtuzumab (Anti-CD52 monoclonal antibody) in patients with relapsing-remitting multiple sclerosis. J Immunol. 2013;191(12):5867–5874. Havari E, Turner MJ, Campos-Rivera J, et al. Impact of alemtuzumab treatment on the survival and function of human regulatory T cells in vitro. Immunology. 2014;141(1):123–131. Fox E, Arnold DL, Cohen J, et al. Durable efficacy of alemtuzumab in relapsing-remitting multiple sclerosis patients who participated in the CARE-MS studies: three-year follow-up. Neurology. 2013;80 (Meeting abstracts 1):S41.001. Coles a J, Wing MG, Molyneux P, et al. Monoclonal antibody treatment exposes three mechanisms underlying the clinical course of multiple sclerosis. Ann Neurol. 1999;46(3):296–304. Coles AJ, Cox A, Le Page E, et al. The window of therapeutic opportunity in multiple sclerosis: evidence from monoclonal antibody therapy. J Neurol. 2006;253(1):98–108. Fox EJ, Sullivan HC, Gazda SK, et al. A single-arm, open-label study of alemtuzumab in treatment-refractory patients with multiple sclerosis. Eur J Neurol. 2012;19(2):307–311. McDonald WI, Compston A, Edan G, et al. Recommended diagnostic criteria for multiple sclerosis: guidelines from the International Panel on the diagnosis of multiple sclerosis. Ann Neurol. 2001;50(1):121–127. Kurtzke JF. Rating neurologic impairment in multiple sclerosis: an expanded disability status scale (EDSS). Neurology. 1983;33(11):1444–1452. Coles AJ, Fox E, Vladic A, et al. Alemtuzumab more effective than interferon β-1a at 5-year follow-up of CAMMS223 clinical trial. Neurology. 2012;78(14):1069–1078. Coles AJ, Fox E, Vladic A, et al. Alemtuzumab versus interferon β-1a in early relapsing-remitting multiple sclerosis: post-hoc and subset analyses of clinical efficacy outcomes. Lancet Neurol. 2011;10(4):338–348. Havrdova E, Arnold DL, Palmer J, Margolin DH. FC1.4 Disease-free outcomes with alemtuzumab: 3-year followup of the CARE-MS studies. In: 2014 Joint ACTRIMS-ECTRIMS Meeting (MSBoston 2014): oral presentations. Mult Scler. 2014;20(1 suppl):14–66. Coles AJ, Arnold DL, Cohen JA, et al. P090 Efficacy and safety of alemtuzumab in treatment-naive patients with relapsing-remitting MS: four-year followup of the CARE-MS I study. Poster presented at 2014 Joint ACTRIMS-ECTRIMS Meeting (MSBoston 2014). Mult Scler. 2014;20(1 suppl):67–284. Hartung HP, Arnold DL, Cohen JA, et al. P043 Efficacy and safety of alemtuzumab in patients with relapsing-remitting MS who relapsed on prior therapy: four-year follow-up of the CARE-MS II study. Poster presented at 2014 Joint ACTRIMS-ECTRIMS Meeting (MSBoston 2014). Mult Scler. 2014;20(1 Suppl):67–284. Genzyme. At four years, treatment effect maintained in more than two-thirds of patients who received Genzymes’ Lemtrada in pivotal studies [press release]. Available from: http://news.genzyme.com/press-release/four-years-treatment-effect-maintained-more-two-thirds-patients-who-received-genzymes-. Accessed January 16, 2015. Tuohy O, Costelloe L, Hill-Cawthorne G, et al. Alemtuzumab treatment of multiple sclerosis: long-term safety and efficacy. J Neurol Neurosurg Psychiatry. 2015;86(2):208–215. Willis MD, Harding KE, Wardle M, Pickersgill T, Tomassini V, Robertson NP. Alemtuzumab: long term follow-up in a single centre cohort. J Neurol Neurosurg Psychiatry. 2014;85(10):e4. doi:10.1136/jnnp-2014-309236.7. Jones JL, Thompson SA, Loh P, et al. Human autoimmunity after lymphocyte depletion is caused by homeostatic T-cell proliferation. Proc Natl Acad Sci U S A. 2013;110(50):20200–20205. Coles AJ, Wing M, Smith S, et al. Pulsed monoclonal antibody treatment and autoimmune thyroid disease in multiple sclerosis. Lancet. 1999;354(9191):1691–1695. Cossburn M, Pace AA, Jones J, et al. Autoimmune disease after alemtuzumab treatment for multiple sclerosis in a multicenter cohort. Neurology. 2011;77(6):573–579. Lemtrada (alemtuzumab). Summary of Product Characteristics. Genzyme Therapeutics Ltd., 2013. Lemtrada (alemtuzumab). Product Information. Sanofi-Aventis Australia Pty Ltd., 2014. Clatworthy MR, Wallin EF, Jayne DR. Anti-glomerular basement membrane disease after alemtuzumab. N Engl J Med. 2008;359(7):768–769. Jones JL, Phuah C, Cox AL, et al. IL-21 drives secondary autoimmunity in patients with multiple sclerosis, following therapeutic lymphocyte depletion with alemtuzumab (Campath-1H). J Clin Invest.2009;119(7):2052–2061. Turner MJ, Lamorte MJ, Chretien N, et al. Immune status following alemtuzumab treatment in human CD52 transgenic mice. J Neuroimmunol. 2013;261(1–2):29–36. Moreau T, Coles A, Wing M, et al. Transient increase in symptoms associated with cytokine release in patients with multiple sclerosis. Brain. 1996;119:225–237. Lemtrada (alemtuzumab). Product Monograph. Genzyme Canada, 2013. National Multiple Sclerosis Society. FDA approves Lemtrada™ (alemtuzumab) for relapsing MS-update. Available from: http://www.nationalmssociety.org/About-the-Society/News/FDA-Approves-Lemtrada%E2%84%A2-%28alemtuzumab%29-for-Relapsing. Accessed January 16, 2015. McCarthy CL, Tuohy O, Compston DA, Kumararatne DS, Coles AJ, Jones JL. Immune competence after alemtuzumab treatment of multiple sclerosis. Neurology. 2013;81(10):872–876. Genzyme. Genzyme’s Lemtrada approved in Argentina for treatment of multiple sclerosis [press release]. Available from: http://news.genzyme.com/press-release/genzymes-lemtrada-approved-argentina-treatment-multiple-sclerosis. Accessed January 16, 2015. Genzyme. Genzyme in the UK: UK news. Available from: http://www.genzyme.co.uk/corp-info/news/local.aspx?id=070714. Accessed January 16, 2015.